The BioBag MaxAir ventilated caddy is a handy little food waste bin which can sit under the sink or on a kitchen counter. The MaxAir is made from recycled plastic and will last for years. Simply line your MaxAir with a BioBag bag and when it’s full the bag can be put straight into your brown bin. Our 10 litre BioBag Compostable Liner, with a tie top, is a perfect fit for your MaxAir caddy. A roll of 20 bags should last a family of four people for up to 14 weeks*. The MaxAir has ventilation slots on all sides, including the lid. 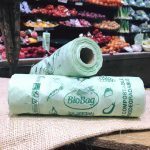 When a breathable BioBag bag is used in the MaxAir, moisture from waste food can evaporate. This keeps the contents odour free and eliminates mould and mildew almost completely. * A BioBag usually lasts an average family of four for 5 days before it would be full and need changing. 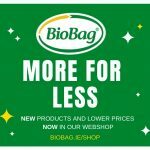 The bag and be put straight into your composting bin for collection and is approved by all Irish waste collection companies. 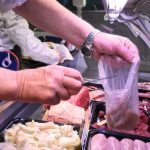 As the moisture has evaporated you can reduce the weight of your food waste by up 40% making it lighter. In turn that makes it cheaper to dispose of when using the pay by weight collection process. The MaxAir caddy can be kept on a countertop or under your sink.